2013 S1-09 Innovation and Entrepreneurship: Students not progressing. The picture below shows how much you have progress as a class with regards to understanding about innovation. 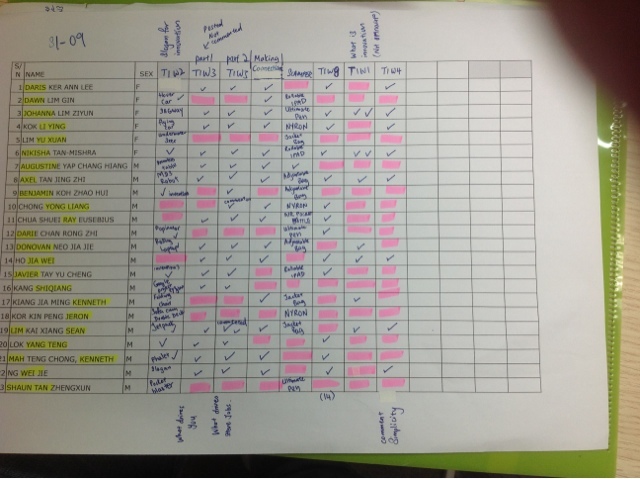 Red highlighted boxes implies you have not thought about the matter till 21st March 2013. Johanna, Nikisha and Axel, well done!!! You are the 3 potential innovators and entrepreneurs at this point in time. And only they would be able to grow above you all. Those behind time/level, You have 1 more week to catch up and think about the post/ homework made or given to help you think as an innovator and have an entrepreneur mindset. We will know now why some have developed in their mindset and some have not. Miss Lim, I did the slogan "necessity is the mother of invention" already for the T1W2 but you marked it uncompleted. Miss Lim, I did all the homework except for T1 W8 but you marked them as incomplete. Miss Lim I did everything! (Late) What drives me and Steve Jobs?